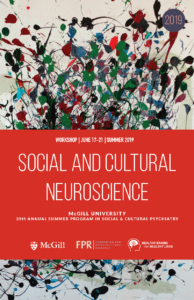 This workshop will provide an overview of core topics and recent developments in social, and cultural neuroscience research in order to promote cross-disciplinary collaboration in global mental health. After an introduction to cognitive, social, and cultural neuroscience, the workshop will focus on the potential and limits of methods that can be used to measure epigenetic, neuroendocrine, and neurocognitive processes in laboratory and field settings. We will discuss the inter-relationships of these processes and how to map them onto phenomenological, ethnographic, and ecological variables through technologies including remote sensing techniques that capture health-relevant aspects of sociocultural contexts in situ. Participants will also have the opportunity to present their own research projects for discussion with faculty. Co-sponsored by the Foundation for Psychocultural Research (www.thefpr.org) and the McGill Healthy Brains for Healthy Lives Program (www.mcgill.ca/hbhl).